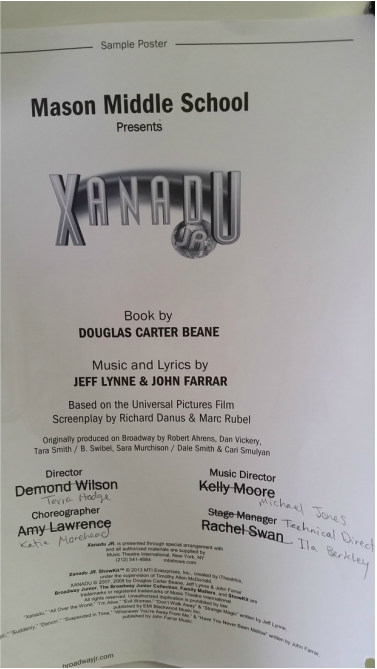 Xanadu JR. ShowKit ™ © 2013 MTI Enterprises, INC., created by iTheatricts, under the supervision of Timothy Allen McDonald. Broadway Junior, The Broadway Junior Collection, Family Matters, and ShowKit are trademarks or registered trademarks of Music Theatre International. All rights reserved. Unauthorized duplication is prohibited by law. “Xanadu,” “All Over the World,” “I’m Alive,” “Evil Woman,” “Don’t Walk Away” & “Strange Magic” written by Jeff Lynne, published by EMI Blackwood Music Inc.
“Magic,” “Suddenly,” “Dancin,” “Suspended in Time,” “Whenever You’re Away From Me,” & “Have You Never Been Mellow” written by John Farrar, published by John Farrar Music.